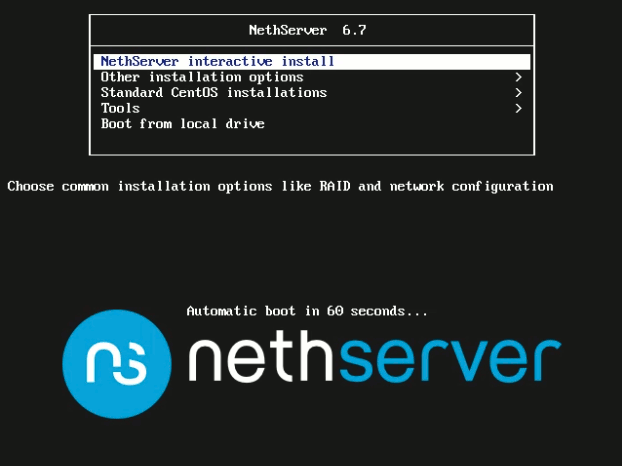 Once you have booted the system from the installation media, the initial NethServer screen shows the boot menu, where you can select the type of installation or access additional tools. If no key is hit within 60 seconds, the default boot option runs. [↑ Up] arrow key: used to highlight previous item in a list. [↓ Down] arrow key: used to highlight next item in a list. [↵ Enter] key: used to confirm an option. [Esc] key (while on a sub-menu): used to return to the previous menu. [↹ Tab] key: used to show and customize the boot options assigned to the highlighted menu entry. It allows you to add extra parameters. To confirm the parameters, press the [⮠ Enter] key. To cancel the edition, press the [Esc] key. Although alternative navigation keys exist ([+] and [-] numpad keys, [← Left] and [→ Right] arrows, [Space], [Start], [End], [Page Up], [Page Down]…), the described options are enough to do the tasks. Additional navigation options: Pressing the [Esc] key at the main menu, will show the boot: prompt, at which you can specify custom boot options. Once in the boot: prompt, the [↹ Tab] key will show the labels assigned to each menu entry. To select and start from one of the menu options, write its label and press the [↵ Enter] key. To go back to the graphical menu, press the [↵ Enter] key at an empty boot: prompt. To learn more about the boot options that can be used at the boot: prompt refer to the Chapter 28 - Boot Options of “Red Hat Enterprise Linux Installation Guide”. Note that NethServer interactive and unattended installation modes make use of kickstart scripts, where most boot options do not apply.